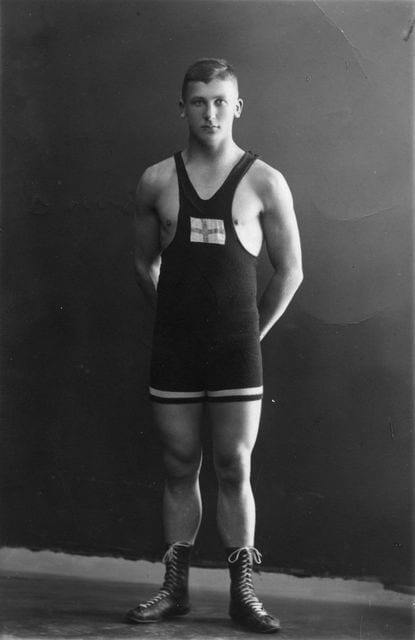 Kustaa Pihlajamäki was Finland’s most famous wrestler in the interwar years. Pihlajamäki won Olympic gold in Freestyle wrestling in Paris 1924 and took his second Olympic victory twelve years later in Berlin. He also gained silver in Amsterdam 1928. In non-Olympic years Pihlajamäki concentrated on European Championships, winning no fewer than nine gold medals between 1931 and 1939. Pihlajamäki was equally at ease in both two wrestling techniques: at the Olympic Games he always competed in Freestyle wrestling, at the European Championships in Greco-Roman style. Pihlajamäki was a policeman and came from a famous wrestling family: his cousin Hermanni Pihlajamäki won Olympic gold in freestyle wrestling in 1932. Kustaa Pihlajamäki died of peritonitis at the age of only 41.